"crossing and recrossing the country every year, south in the winter and north in the summer, and only because he had no place he could stay in without getting tired of it and because there was nowhere to go but everywhere"
Today I gave notice at my job that my last day would be June 4th. Instead of working my miserable job that violates many of my values, I will spend June and July living in my car and traveling the country. I'm very excited and slightly terrified. It's so easy to say you want to do things or live a certain way, but it's much more difficult to actually take action on your dreams. When I was 21 years old I vowed to visit all 50 states before I turned 25 years old. But, on my 25th birthday earlier this month I had only been to 43 states. Somehow I got sidetracked. I fell into mainstream beliefs that the only way to survive into adulthood is to slow down, settle, find someone to marry, and make enough money to buy a lifestyle that defines your identity. For awhile I put myself on that track with some reasonable success, but eventually I found myself inert and unhappy. I've always wanted to visit all 50 states. I've always wanted to drive the Alaska Highway. I've always wanted to visit Badlands National Park, Denali National Park, Yosemite National Park, and Arches National Park. I've always wanted to live on the road for more than a month. It's so easy to dream like this, but put it off until you have more money, until you have more time, until you have someone to travel with, until your kids grow up, or until you retire. I've resolved to stop deferring my dreams. I am going to go do those things now. I am going to get happy. I am going to do it myself. I'm doing this because I feel compelled to do this. It's something my heart has yearned for since as far back as I can remember. I will not be completely happy or satisfied until I do it. When you feel that way about something it's your responsibility to yourself to make it happen. I would be doing myself a disservice to not go. I cannot be myself until I go. 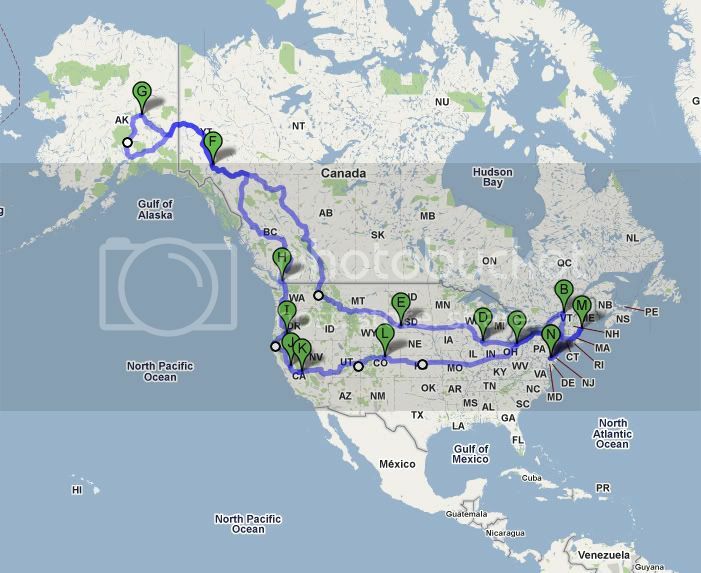 This is vaguely the route I will be taken, though it will be subject to change at my whim. While I'm traveling, I'll be using this blog to document my experiences and record my thoughts. Reading regularly will be the best way to track my whereabouts, if you are so interested and inclined.